It's always a great experience to get behind the scenes, be it any kind of art. Budapest Art Week has been offering visitors the opportunity from the beginnings to get a glimpse at the spaces where artworks are born. This year, Csaba Fürjesi's Budapest studio will be open to the general public for the first time. You are opening your Budapest studio for the public for the first time. Have you ever let “outsiders” in there? Yes, of course. For the past twelve years, we have been having regular gatherings in the studio, like a contemporary version of a salon from the Belle Époque. We usually invite thirty or forty guests for these evenings, with art professionals, collectors, patrons, and, of course, artists among them. I really enjoy hosting these evenings because they provide a great setting for making new acquaintances. How do you take feedback from your visitors? Visitors have not experienced the creation process, they only see the finished artwork, and their interpretations can be totally different depending on their personality. From the artist's point of view, it is always interesting to consider a thought-provoking idea coming from others. One of the great things about a studio tour is that such conversations can be conducted. I know you have another atelier abroad. That's right, I have a studio in Salzburg too, because all three of my children are studying there, and I like to be there as well. Of course, both have its own benefits. 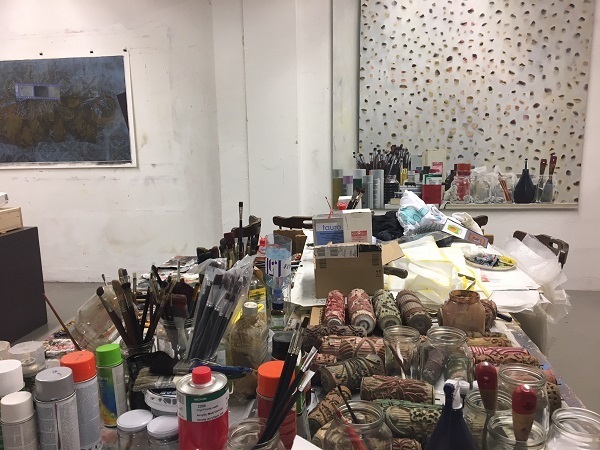 My Budapest studio is in the attic of our house, and the one in Salzburg is in an old factory building, where other artists occupy the rest of the space. The two places have a different mood, but I feel great in both of them. You have about the same amount of exhibitions here and abroad. Are there any differences between the shows, depending on their location? The questions or the messages my works convey resonate differently with the audience, because the traditions, the history and the current issues of the two countries are vastly different. I think exhibitions are still one of the most important things in the life of an artist, at least in my case. But there is a lot more to them than the presentation of new works. From the creator's point of view, they always mean the end or the beginning of a period, which has to be manifested in the exhibition. You also have connections to the Cered artists’ colony. What does that place mean for you? The colony began twenty-three years ago. The original idea was to sit around a campfire, talk about art and contemplate the great questions of life. Since then, hundreds of artists and professionals from varying fields and from many countries have been involved. After the two-week creation period, we have a regular open day, whose popularity has been increasing every year. I have started making light-boxes using old photographs – my inspiration for that was a recent scholarship in Rome. The original meaning of the photos changes and broadens with the help of graphic light, adding a different dimension to the originals. interview | During Budapest Art Week, Várfok Gallery is hosting not one, but two openings: the newest paintings of Levente Herman and the photographs of Mátyás Misetics, both regular artists of the gallery, are expertly planned, precisely executed, brilliant compositions. The art director of the gallery, Krisztina Kovács has taken the time to answer our questions. interview | The Molnár Ani Galéria awaits visitors at a new location in the Palotanegyed (the inner 8th District) during Budapest Art Week. We have asked Ani Molnár, the owner of one of the most successful contemporary art galleries about what she loves most about running a gallery and how to understand contemporary art.